Lynette Kennedy is not sure where she would be today or what she would be doing if bear making did not come into her life. Over the past several years this "passion” has kept her going and allowed her to visit places "around the world that I normally would not have visited," she said. "With all my travels I've made many good friends along the way and at each exhibition we catch up on our lives during the past months." As a child growing up in South Africa, she cannot remember teddy bears being the “in” thing, as neither she nor her friends had any teddy bears. 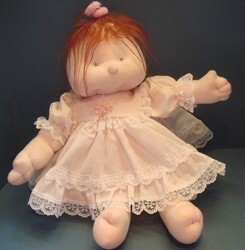 "We did have dolls and these were dressed, fed and put to bed," she remembered fondly. Lynette started sewing when she was 16 and purchased her first sewing machine by making monthly payments. "After 41 years I still have my faithful sewing machine although it is resting. 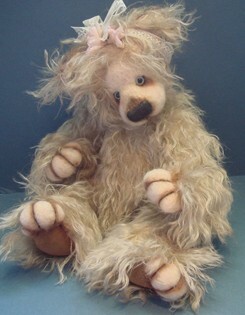 I do most of my teddy bear sewing by hand but use a more updated sewing machine to make clothes for teddy bears, dolls and grandchildren." Lynette's career started off as an accounts clerk then finally as an accountant, she ventured into operating her own businesses. These ventures kept her on her toes selling craft and patch-work supplies. "I tended to try anything new, in order to understand what I was selling. The day eventually came when I was exhausted from long shop hours and decided it was time to sit back and put my feet up." 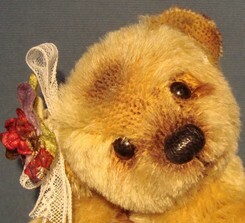 This was shortly lived as her fingers got itchy and soon the hobby of making teddy bears became a new business. Today, she has almost come full circle, being back into a retail business as she has set up a home based teddy bear, doll, and craft shop accessible over the Internet. Initially she purchased patterns and used these as guidelines. In those early days, if the pattern said “place arm or leg here” that is where it went. Some bears looked rather strange and soon she realized that the patterns could differ greatly when different fabrics were use or if the pattern designer wasn't very good with the markings. "Soon I started tweaking patterns to get the look I wanted. Most of my designs have resulted by making mistakes so “I live and learn from my mistakes" which is currently my motto," Lynette said. Married with two children, two grand children, and a third grandson due soon, she makes her home on the Witwatersrand in South Africa where gold was mined and is still mined today. 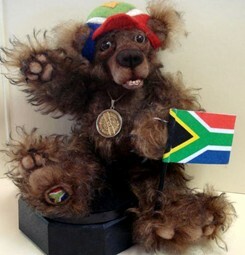 "South Africa is truly a rainbow nation with many various races. Our ancestors came from the Irish, French, Dutch and British who settled in South Africa." 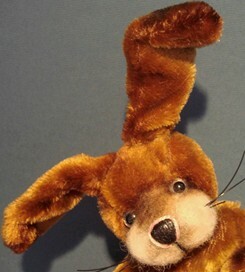 Lynette enlists the help of an African woman named Irene, who she has taught to make bears. Irene, being HIV/Positive, uses the money she makes from helping to purchase any extra medication she might require. Lynette helps in other ways too. "If I am working with real fur, I will give 50% of my profit back to the bears in need. In this way, I am in a small way, giving back to the animals." 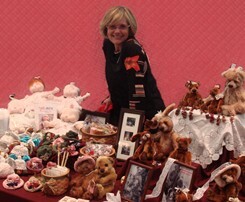 During the course of a year, Lynette makes roughly 75 bears which she sells through her web site or takes to International shows in Japan, South Korea, Taiwan and Europe. 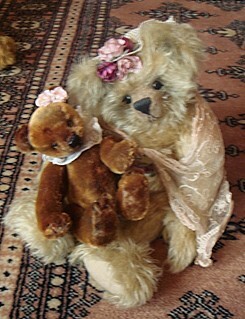 And although she's noticed a slowing trend on purchasing, she has great hope for the future of our beloved Teddy. "We will be seeing many changes through out the world, people will be unemployed, yet many new inspirations will be born as people seek ways of fending for themselves." 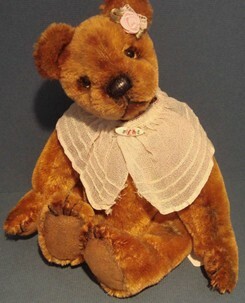 "But our faithful friend, Mr. Teddy Bear, during the past 100 years has lived through many world wide turmoil’s and is still with us to tell the story today. I am sure that he will continue to tell his stories in many hundred's of years to come." was the torch bearer for the Online Olympic teddy bear challenge that Lynette helped organize. Above are Lynette's table displays in London and Korea.